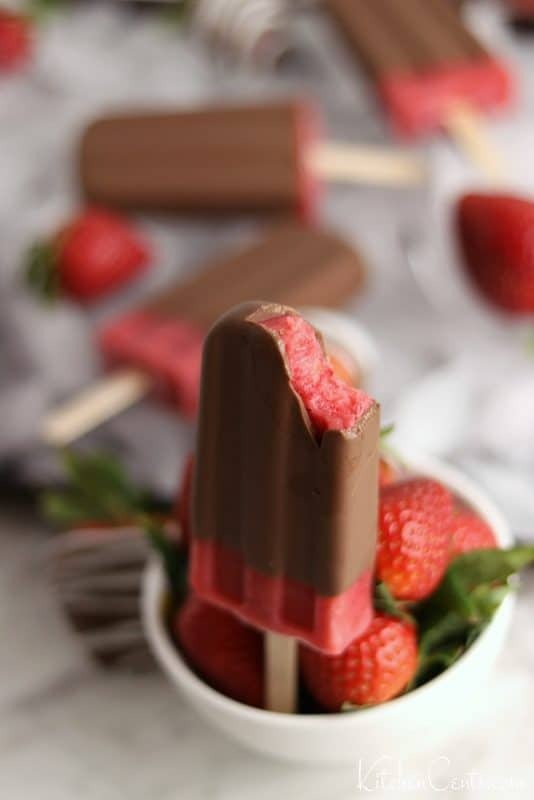 Chocolate Covered Strawberry Popsicles – refreshing popsicles made with whole fresh strawberries glazed with a thin layer of chocolate. An easy, healthy 3-ingredient frozen treat. Popsicles are such a fun treat to have when it starts warming up outside. 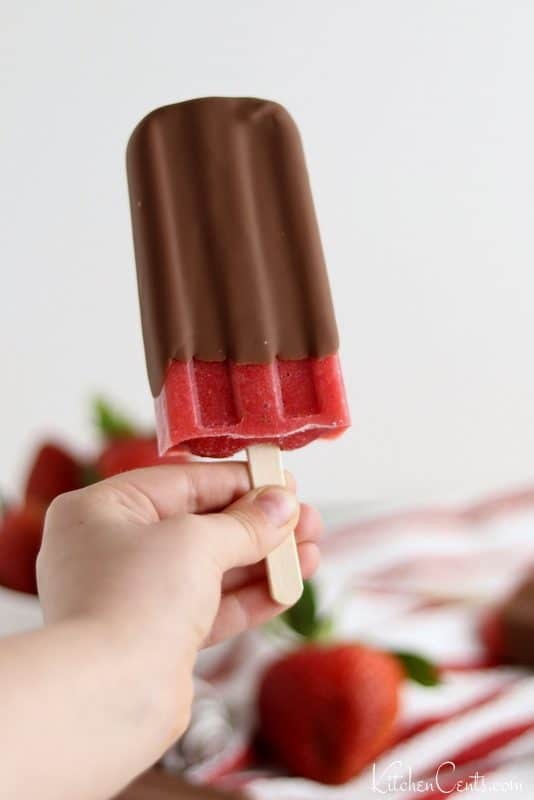 With spring here, everyone is looking for healthy frozen treats and these Chocolate Covered Strawberry Popsicles are just the ticket. They are full of healthy, fresh benefits with just a hint of sweet chocolate. 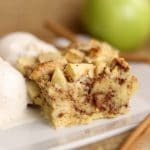 With only 3 ingredients, these chilled desserts are refreshing, guilt-free treats that will be loved by kids and adults alike. 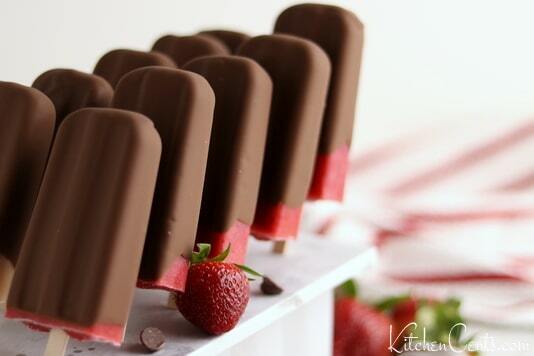 These delicious strawberry popsicles covered in chocolate only have 3 simple ingredients in them. 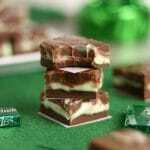 coconut oil or cream (cream will give the chocolate a bit softer texture whereas the coconut oil will offer more of a crunch). I’ve used many different popsicle molds but the one I used to make these strawberry popsicles is my favorite. You can find it HERE. It makes 10 popsicles and has such a professional look to them. I love it. When using any mold that allows you to use wooden popsicle sticks, make sure the sticks are straight up otherwise it may be difficult to remove the lid after freezing. These popsicles are really easy to make. You can use fresh or frozen strawberries. Make sure you are using plain-Jane strawberries (no sugar added). Puree the strawberries. If using frozen, allow the berries to thaw slightly before pureeing. Once pureed, fill each popsicle cup mold to 1/4 inch from the top (leave a little room for freezing and expanding). Place lid on mold then insert a popsicle stick into each cup. Freeze (at least 4-6 hours but best if overnight). PRO TIP: Buying popsicle sticks in bulk can be much cheaper (>$0.01 per stick). Check out the craft section of your favorite store to find cheaper sticks or find them in the craft section of most dollar stores. I’ve found the cheapest place to buy popsicle sticks is online in bulk. 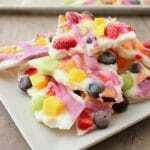 We use popsicle sticks for crafts and in the kitchen so leftovers are always happily welcomed. When ready to dip them, melt the chocolate (with cream or coconut oil). 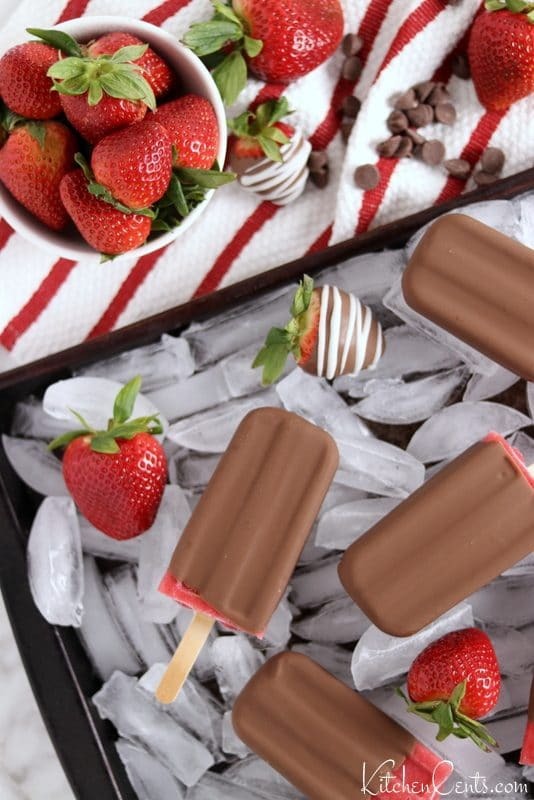 Remove each popsicle from the mold and dip in melted chocolate mixture. Allow it to harden before placing in a bag (back in the freezer). That’s it! Easy peezy! For an all natural, 100% fresh fruit popsicle (with the added chocolate goodness), these popsicles are much cheaper to make than to buy! 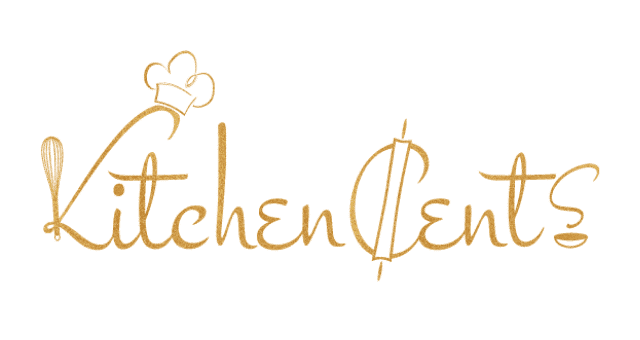 Prices for supplies may vary depending on location and store you purchase groceries from. 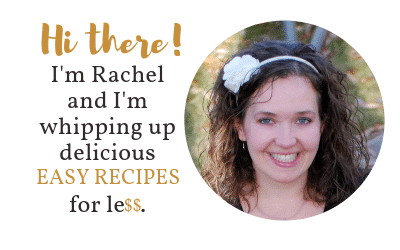 I try to shop bulk food stores, use coupons, watch ads and shop sales (like case lot), buy supplies in bulk to save money in the long run and use homegrown produce and herbs when available. These are a great way to stay within my grocery budget without sacrificing flavor or nutrition. The total cost for me to make a batch (10 gourmet popsicles) was $4.30. That’s a screaming deal! The cost for each popsicle was about 43¢. My girls think they are delicious and I know they are healthy and inexpensive. That’s a win, win! For a whole fruit popsicle bought at the store, they can run upwards to $2 a popsicle. That’s nuts! You can find the full printable recipe below. I hope you love this recipe as much as we do! Enjoy! 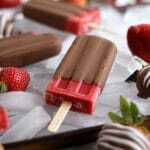 Naturally sweet, refreshing popsicles made with whole fruit fresh strawberries and glazed with a thin layer of chocolate. An easy, healthy 3-ingredient frozen dessert! Wash and remove stems from strawberries. Puree. If using frozen, allow them to thaw a little before pureeing. Fill each mold with puree. Fill to a 1/4 inch from the top to allow room for stick and expanding during freezing. Place lid on molds, insert sticks. Make sure sticks are straight in each cup. When ready, melt chocolate and coconut oil in the microwave (30 seconds at a time, stir in between) This should only take about a minute. Remove each popsicle from it’s mold. Dip in chocolate and tap to remove extra. Let chocolate harden before placing in a bag and back in freezer or enjoy immediately. 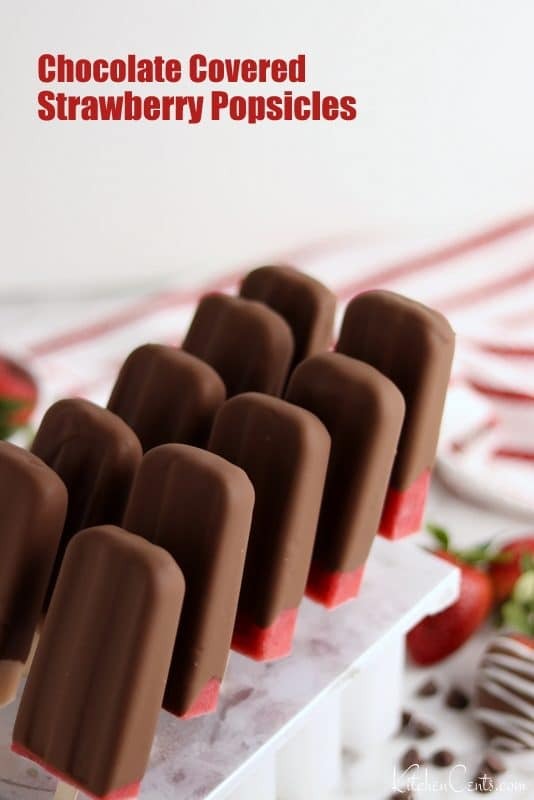 This recipe has been designed to make 10 3oz strawberry popsicles to be dipped in chocolate. If using a popsicle mold that is bigger or small than 3oz cups, this recipe will need to be adjusted. If using cream, heat as directed. Stir chocolate until cream is fully mixed in. This can take 1 to 2 minutes.